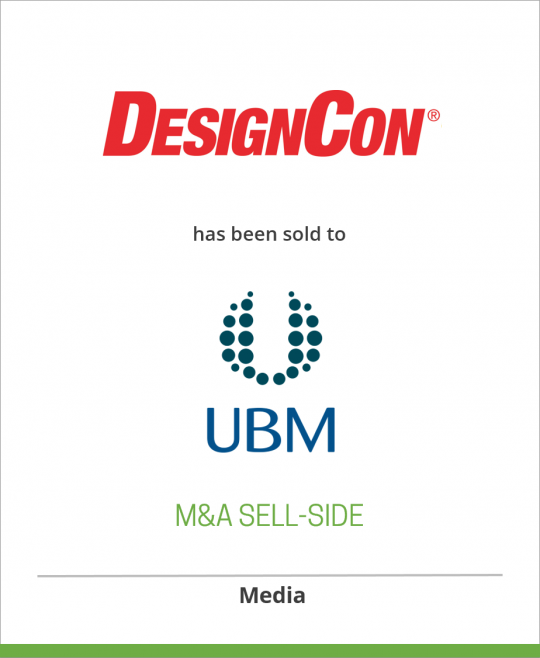 Professional Education International has sold DesignCon to EE Times Group, a wholly-owned subsidiary of United Business Media. DeSilva+Phillips, Mediabankers ™ announces that its client Professional Education International (PEI), a leader in the information and communications technology conference arena, has sold DesignCon, an exhibition and conference serving the electronic design and semiconductor industry, to United Business Media’s wholly-owned subsidiary, EE Times Group. Founded in 1996, DesignCon (www.designcon.com) is an annual four-day Silicon Valley-based exhibition and conference event which attracts more than 120 exhibitors and 3,300 professionals from the electronic design and semiconductor industries. The event’s primary focus is on the software and tools used by electronic designers and engineers in the construction of semiconductors. The exhibition is complemented by a co-located 17-track conference which provides highly regarded seminars, panels and keynote addresses. The business also provides year-round products and services, such as the InfoVault technical library, primarily via the event’s website. UBM is a leading global provider of events; data, marketing and information products; print products; and targeting, distribution and monitoring services to specialist business communities. Our 5,800 staff in more than 30 countries are organised into specialist teams that serve these communities, helping them and their markets to work effectively and efficiently. For more information, go to www.ubm.com. EE Times Group is the global leader in media and marketing services for the electronics industry. Through our market-leading brands, we deliver results for the key influencers and decision-makers involved in the design, development and commercialization of technology. More than 1.1 million engineering professionals and professionals in the electronics industry engage with the EE Times Network – EE Times, TechOnline, DesignLines, and Embedded.com – across the globe. The technology community comes to our market-leading events to share, learn, discuss and advance the critical issues and challenges facing the electronics industry. EE Times Group also provides end-to-end research, marketing and media services. For more information, go to http://www.eetimesgroup.com/.